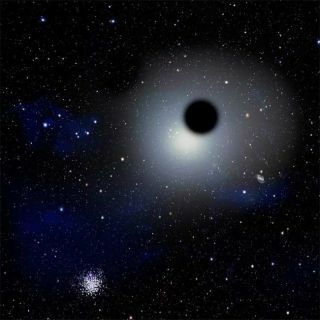 This artist's conception shows a rogue black hole floating near a globular star cluster on the outskirts of the Milky Way. Hundreds of massive black holes left over from the earlyuniverse may wander the Milky Way, according to new calculations. These rogueblack holes are thought to have originally lurked at the centers of tiny,low-mass galaxies. Over billions of years, those dwarf galaxies smashedtogether to form full-sized galaxies like the Milky Way. The idea of such wandering black holes hasbeen suggested before, but a new computer simulation calculated thathundreds of them should be left over, and predicted that they might now beshrouded by small star clusters. "These black holes are relics of the Milky Way?spast," said researcher Avi Loeb of theHarvard-Smithsonian Center for Astrophysics. "You could say that weare archaeologists studying those relics to learn about our galaxy?s historyand the formation history of black holes in the early universe." It appears that Earth is safe. The closest rogue black holeshould reside thousands of light-years away. Astronomers are eager to locate them for the clues they willprovide about the formation of the Milky Way, since they are thought to datefrom the universe's galaxy-building days. Back then, whenever two young galaxies with central blackholes collided, their black holes would mergeto form a single black hole. In the chaos of the merger, the black holecould be flung out toward the edges of the galaxy, the new computer modelshows. It predicts that hundreds of such black holes would still bearound today in the outerreaches of the Milky Way, each containing the mass of 1,000 to 100,000suns. They would be difficult to spot on their own, though, because a blackhole is not visible. They can be detected, however, when matter they're aboutto swallow is superheated as it accelerates inward. Another telltale sign could mark a rogue black hole: asurrounding cluster of stars yanked from the dwarf galaxy when the black holeescaped. Only the stars closest to the black hole would be tugged along, so thecluster would be very compact. These clusters are so small that each looks like a singlestar from far away. Thus, astronomers will have to use tricks to distinguishthem, such as separating the light from the clusters into its component colorsto discover the individual stars hiding inside. "The surrounding star cluster acts much like alighthouse that pinpoints a dangerous reef," said Harvard-SmithsonianCenter for Astrophysics' Ryan O'Leary, who co-wrote the paper. "Without the shining stars to guide our way, the black holes would be allbut impossible to find." The number of rogue black holes in our galaxy depends on howmany of the early galaxy building blocks contained black holes at their cores,and how those proto-galaxies merged to form the Milky Way. Finding and studyingthem would provide new clues about the history of our galaxy. Locating the star cluster signposts may turn out to berelatively straightforward. "Until now, astronomers were not searching for such apopulation of highly compact star clusters in the Milky Way's halo," Loebsaid. "Now that we know what to expect, we can examine existing skysurveys for this new class of objects." The research will be detailed in an upcoming issue of the journalMonthly Notices of the Royal Astronomical Society.